Fortunately, this time, you actually have a character and not just a spelled-backwards name. In the spirit of the approaching holiday, I’ve decided to visit some horror classics–other than Resident Evil. Yet, as last week’s Onimusha entry exemplifies, sending a fully armed character into a gauntlet of monsters who charge at him with the survival instincts of a depressed lemming don’t often contribute to a sense of dread in the player. As such, sometimes we overlook games belonging to the genre, despite, say, a gloomy castle setting, epic fight with death personified and a legendary vampire as the primary antagonist. Yes, the Castlevania series, originally a tribute to classic horror, may have spent its creative load and gathered together such an eclectic collection of anything vaguely monster-ish that it feels like remaking a Roman Polanski film with Mel Brooks (as an alternative joke, try “replacing Harvey Keitel with Harvey Korman”). Also, none of the monsters or levels may have ever scared me as much as the difficulty. However, it still has all the telltale details of horror; creepy castle, monsters, an antagonist who several characters refer to as a vampire, despite never biting a single neck. So while I can reasonably include it in the horror genre, and with Halloween next week, let’s examine Castlevania: Symphony of the Night, to see why everyone raves about this thing. How to identify a vampire…well, he doesn’t brood, sparkle, play awesome thunder baseball, chase teenage girls, or drive a volvo, so no. Keep looking. First of all, a few weeks back I lamented the loss of 2-D Metroid games, asking where they went after Metroid Fusion. Well, I found them. They crash landed in Transylvania. Also, Samus traded her energy beam for a sword, her power suit for holy relics, and space pirates for horror monsters. Also, she became a guy. And half-vampire. And now she levels up. 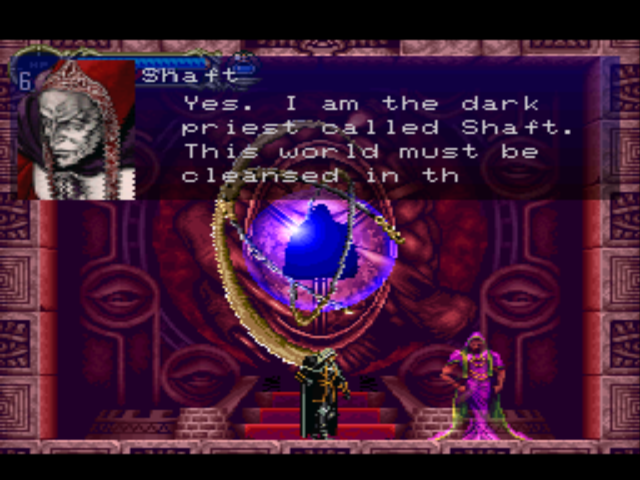 Symphony of the Night combines RPG elements with Metroid-style gameplay, meaning it connects with the previous Castlevania series only through a handful of characters and having the same number of dimensions. 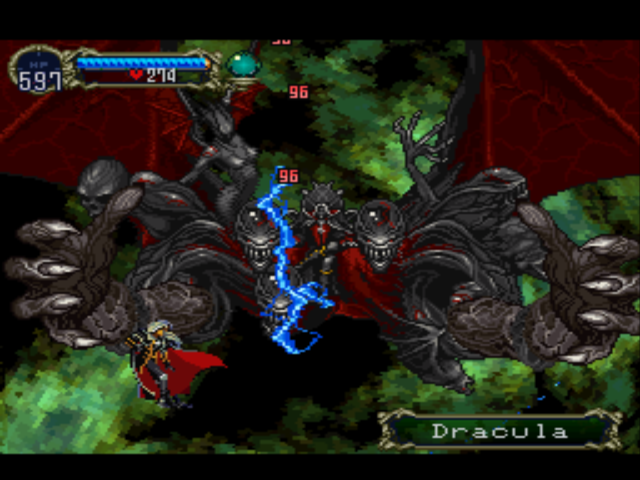 The legendary half-human son of Dracula and long-time acquaintance of the Belmont clan, Alucard begins this game dashing toward the castle at an exciting pace. For some reason, he wants to get inside before nightfall. At least, I assume he has a reason. Dracula hasn’t come back to life, Alucard doesn’t know anyone has planned a resurrection, and he doesn’t even know the identity of the castle’s lord. So he wants to get inside and slash up the joint because…angsty teens need to flout their fathers’ authority? Lack of motivation aside, the game plays a lot like a hybrid of Metroid and Castlevania (thus earning the newer games in the series the oh-so-very-clevery term, “Metroidvania”). Rather than the level-by-level design, an unstated assumption in NES-era games, Dracula opted for an expansive, labyrinthine castle built with special architectural oddities–high ledges, platforms, spikes, etc–that prevent anyone from actually accessing any useful areas of the castle. Fortunately, he scattered enough relics to imbue any burgeoning vampire killers with the necessary superpowers to overcome these barriers. Thus Dracula ensures his own demise, but only by vampire slayers with creative problem-solving skills and enough patience, determination and mental instability to keep running circles through the castle, stabbing walls in hopes of finding a pot roast. Along the way, Alucard picks up a number of weapons, armor, capes, accessories and pot roasts, which augment his stats in addition to leveling up the old fashioned RPG way–repetitive monster murder. Despite the innovative–well, for Konami, at least–game play, Symphony of the Night does retain one core element of earlier Castlevania games: whenever Alucard takes damage, he summons up all of his 300 years of teenage angst, taps his inner Mario, and hurls himself backwards with all the might of a melodramatic lemming caught in a wind tunnel. I realize that Konami includes this element as a challenge, that recovery from taking damage makes the game harder, but I feel like they’ve passed the limit with this mechanic. 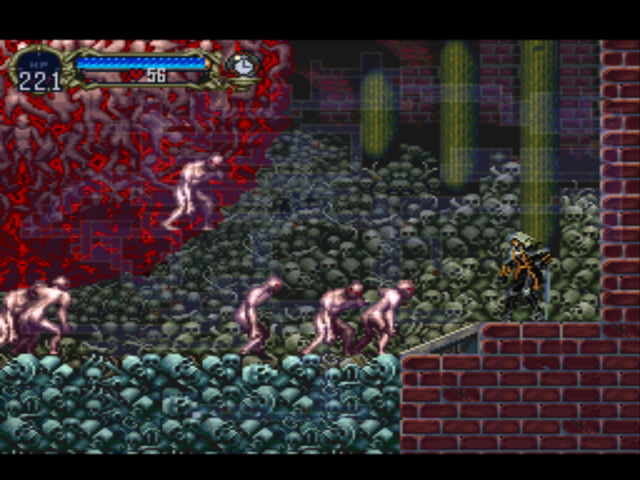 Often times when fighting a boss or, even more infuriating, the flying medusa heads, Alucard will hurl himself halfway across the screen until he hits the next enemy, which will launch himself in the opposite direction back at the first. On these occasions, I had no choice but to set aside the controller and simply watch the game bounce him back and forth like a tennis ball at the Wimbledon championship. Cloud of noxious gas and monsters falling out of the sky…this picture needs no caption. When he does manage to plant his feet on the ground, though, Alucard has more options at his disposal than the typical Belmont. 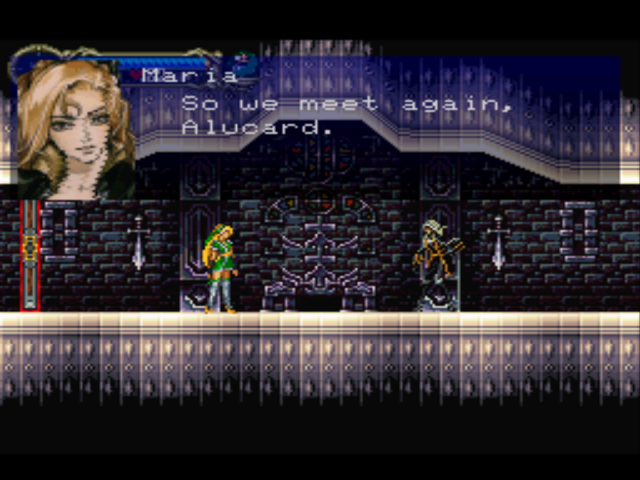 Rather than fighting like a plantation overseer, Alucard generally uses swords, which he finds throughout the castle. In abundance. In fact, not counting the one-time use throwing weapons, the game offers you over 70 different swords, rods or maces, ensuring that about 80% of the time when you discover a new weapon, it won’t have nearly the attack power as the one you already have equipped. Equally useless, you can buy magic spells that require Street-Fighter-like inputs to execute. One marked as “Heal HP by shedding blood,” seemed to have no effect than to slightly lower my MP–no blood shed required. I found that the standard jump-and-slash routine worked for all but the most difficult of bosses, so the spells function about as effectively as parrot feathers–very impressive but do nothing to enhance the flavor. 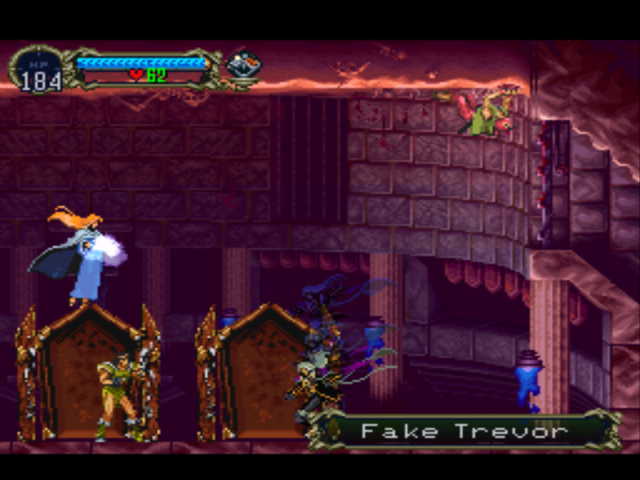 By picking up relics in the castle, you also gain the ability to transform into vampirey things, like a wolf that can trot casually and bark at things, a bat that can fly until colliding with any particles floating on the breeze, or a cloud of mist which, once upgraded to a poison gas, allows the player to drift through the castle with the silence, deadliness, and physical appearance of a good, rancid fart. He’s one bad mother–shut yo’ mouth!–I’m just talking about Shaft! Many games feature multiple endings, but Symphony of the Night offers the added bonus of denying half the game to you if you get the crappy ending. Dracula’s moonlit chamber, as well as the surprise boss fight, become available as soon as you take the little leathery training wheels off your bat wings. 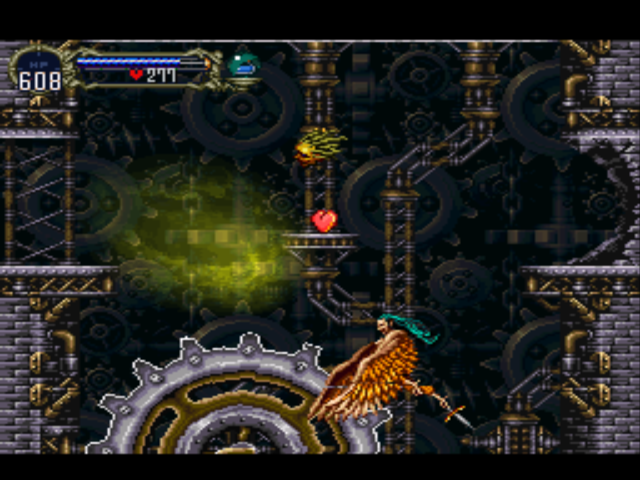 However, if you fight all the optional bosses in the first half of the game, get all the proper items and cut scenes, and interpret the riddle “wear in the clock tower” as referring to the long hallway filled with clocks (instead of the area outside Dracula’s chamber like in every other Castlevania game), you’ll get an artifact that lets you see the invisible demon possessing said surprise boss: Shaft! (Who is the thing that would resurrect his vampire king? Shaft! Can you dig it?) If you aim for Shaft, he’ll run off into the sky and summon a new castle. The game continues and Alucard has to fight his way through the same castle he just went through, only upside-down. I guess inverting the map made for easier work for the programmers. So we fight a massive sphere of conglomerated corpses in a room that makes the Paris Catacombs look cheery…but we fight Dracula at the end? Have you no sense of escalation? While the first half of the game focuses on exploration and accessibility of new areas, the inverted castle hearkens back to the hack-and-slash roots of the series, where all you do is hunt down the new bosses to capture the relics of Dracula so you can face Shaft. And then Dracula. Here you fight dopplegangers of yourself, Trevor, Sypha and Grant (from Castlevania III), series favorite Death, Beelzebub, and a number of other monsters that would easily make a much more epic final boss than Dracula. Who, by the way, bears as much resemblance to a vampire lord as a xenomorph bears to Bill Nye. I think, though, that Symphony of the Night deserves the hype it receives. While I usually think that including a character named “Alucard” represents a witticism long since dried up, set on fire, peed on, and then left to dry up again, they actually turned him into a real character with conflict and a beef with his dad, even if he didn’t really have a reason to show up at this castle in the first place. This game may even have a leg up on the original NES version on account of players actually having a chance to finish it. Barring the Resident Evil quality voice acting and a handful of demons that make kitty cat noises, they did enough to revitalize the series, resurrect Metroid, and then promptly use up all that new vitality on about seven thousands sequels. This entry was posted in Castlevania, PS1, PSP, Sega Saturn and tagged Castlevania, ps1, psp, Sega Saturn. Bookmark the permalink.